IBM® Financial Crimes Alerts Insight with Watson® enables financial institutions to leverage Watson analytics and cognitive capabilities to create an accurate and sustainable Anti-Money Laundering (AML) program. It optimizes systems and analysts, reduces false positives and accelerates investigations by using data from historical cases, leverages a better understanding of entity and network risks and applies experienced-based machine learning. Financial Crimes Alerts Insight provides users with more efficient and accurate alerts including surrounding contextual information and analysis to support and accelerate well-informed AML decisions. Increases the speed and accuracy of investigative insight with Watson automated extraction of case notes, memos and natural language data to improve productivity. 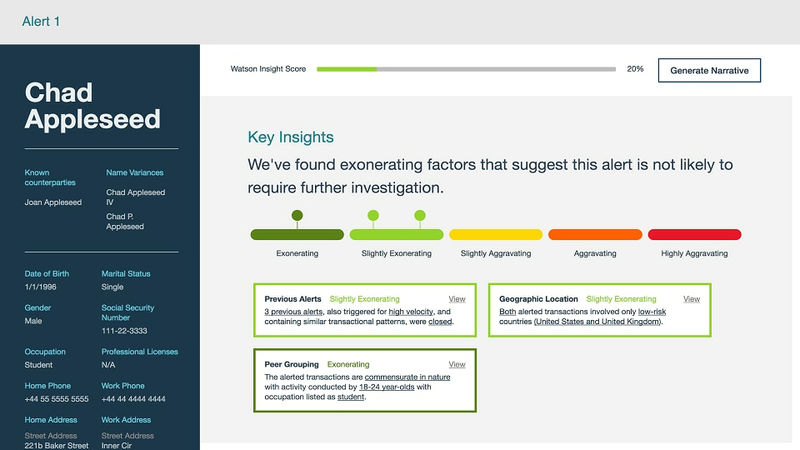 Uses Watson enabled cognitive accelerators to deliver superior speed and accuracy of alerts enabling contextual insights into suspicious or exonerating factors. Boosts system and analyst effectiveness by minimizing workload with greater standardization, consistency and efficiency resulting in lower costs and decreased compliance risks.